Mouth Watering Recipe with Zucchini Noodles! TheFittChick program is ALL about eating nutrient dense foods that keep you FULL! 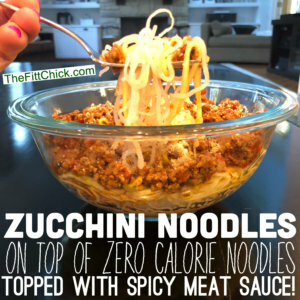 This is my largest mixing bowl layered with zero calorie noodles, zucchini noodles, and 4-oz of spicy meat sauce made with grass-fed beef from ButcherBox! Can you say YUM? I LOVE eating HUGE portions of the foods I love! AND I love to feel satisfied! This is definitely a dinner I will be putting back into my weekly rotation! I forgot how much I missed zoodles!